ULAN BATOR, June 11 (ChinaMil) -- Chinese troops to participate in the " Khaan Quest-2018" joint peacekeeping exercise arrived in Mongolia on June 11, 2018. The thirty-five Chinese troops consisting of thirty-one men and four women are mainly from a brigade of the 81st Group Army of the PLA. The four female soldiers will take part in drills of medical treatment, nursing and civilian protection. According to Zhang Yi, instructor of the Chinese participating troops, they had two-month-long targeted training focused on such subjects as regional defense, riot control, guard and search, battlefield first aid, civilian protection and so forth. Chinese participating troops will also attend the China Culture Night, one event of the multinational cultural exchange and demonstration activities during the exercise period. 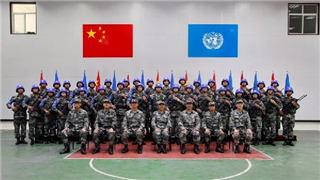 It is reported that fifty-two countries, including China, Mongolia, the United States, Indonesia, the Philippines and Malaysia, will participate in or observe the multinational peacekeeping exercise. Sponsored by Mongolia, the “Khaan Quest-2018” Joint Military Exercise has been held annually since 2003. At first it was a Mongolia-U.S. joint exercise, and got expanded into a multilateral peacekeeping exercise in 2006.In recent years, the joint military exercise has been developed into a significant platform for military cooperation and exchanges among countries in the region.